Offer our youngest children consistent, continuous skilled care in family style, mixed-age communities. Provide for infants and toddlers longer term relationships with nurturing primary caregivers in well-equipped classrooms. Help children develop better emotional control, sense of self and respect for other children, while creating a platform for future learning and academic success. Provide a buffer for children whose families may be less stable due to poverty, illness, job loss and/or frequent moves. Provide State-approved trainings for teachers to learn best practice for mixed-age groups of infants and toddlers. Include coaching for teachers where mentors observe classrooms, engage as active participants, discuss classroom strengths and challenges, and support teachers' profressional growth. Include mentoring/coaching for directors to assist program development and administrative functions. 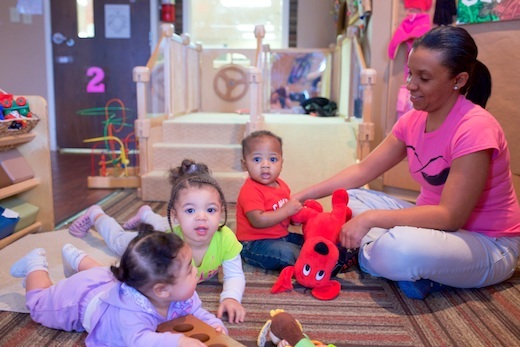 Assist centers in transforming programs from single-age groups to mixed-age groups of infants and toddlers.